The 7th Edition of NEONATOLOGY celebrates the Silver 25th Anniversary of this widely used and practical reference! This latest edition is available to order through your medical bookseller or directly from Amazon.com. Also available on Kindle. 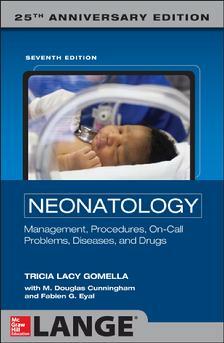 For more than two decades, Neonatology, edited by Dr. Tricia Lacy Gomella, has been the field's go-to guide for practical, up-to-date, and readily-accessible information on basic and advanced management techniques for the neonate. Featuring a logical outline approach that highlights essential information, this quick reference covers everything you need to know about on-call neonatal problems, procedures, diseases and disorders, and pharmacology. Ideal for the student, resident, fellow, nurse practitioner, physicians assistant, neonatal nurse and practicing physician it covers the latest developments in the field to provide state of the art newborn care. Online enhanced content to complement the book includes an Image Library and a extended listing of Effects of Drugs or Substances Taken During Pregnancy and Breastfeeding beyond that found in the bound book.